Why did Pacific peoples offer their most prized possessions to Captain Cook and the European explorers who followed? Boarding a train in central London and heading north through the lush English countryside, it takes me less than an hour to reach the Museum of Archaeology and Anthropology at the University of Cambridge. The MAA is one of the university’s eight museums—and surprisingly small for a repository of “a million artefacts representing two million years of human history,” according to the museum’s web site. I‘ve come to see some of the MAA’s most prized holdings: the Pacific artifacts and works of art collected during the three voyages of British navigator Captain James Cook and the explorers, traders and missionaries who followed him. These late eighteenth- and early nineteenth-century collections, which have long served as a primary source for the study of art and culture in Oceania, are the subject of a new book, Artefacts of Encounter, published by the University of Hawai‘i Press. The volume tells many stories about early Pacific collecting and the various ways in which these artifacts ended up at Cam-bridge. But it also tells a larger story of encounter between European and indigenous peoples by re-examining that history via the artifacts and, significantly, the perspectives of the Pacific cultures that created them. The Museum of Archaeology and Anthropology in Cambridge, England, houses a magnificent collection of Pacific artifacts collected by early European explorers and missionaries. Above, museum director Nicholas Thomas examines a paddle from Aotearoa (New Zealand) collected by Captain James Cook. When Captain Cook departed England in 1768 on the first of his three Pacific voyages, sailing west aboard the HMS Endeavour around Cape Horn, his primary objectives were to observe the transit of Venus from the island of Tahiti and to find the “Great Southern Continent” that had long been the subject of geographic speculation. Cook never found the southern continent, for which he also searched on his second voyage. Neither did he find a northwest passage connecting the north Atlantic and Pacific oceans, which was the aim of his third voyage. But what Cook accomplished in a decade of exploration (1768–1779) was considerable. Sailing across large swaths of largely uncharted ocean, he mapped islands from Aotearoa (New Zealand) to Hawai‘i in greater detail and on a scale not previously achieved. He made the first recorded European contact with the eastern coast-line of Australia, the first recorded contact with the Hawaiian Islands and the first recorded circumnavigation of New Zealand. In the process he visited all four corners of the Pacific Rim: Tierra Del Fuego, Alaska, Siberia and Australia. Cook returned from his travels with more than two thousand artifacts that are now dispersed in museums throughout the world. The largest of these collections—some two hundred objects—is housed at Cambridge, including one hundred of the rarest items from the first voyage. The museum holds some two hundred of the two thousand items given to Cook during his Pacific voyages—the largest single collection of Cook’s artifacts in the world. Rachel Hand, the MAA’s collections manager, greets me and shows me to the ground-floor gallery. 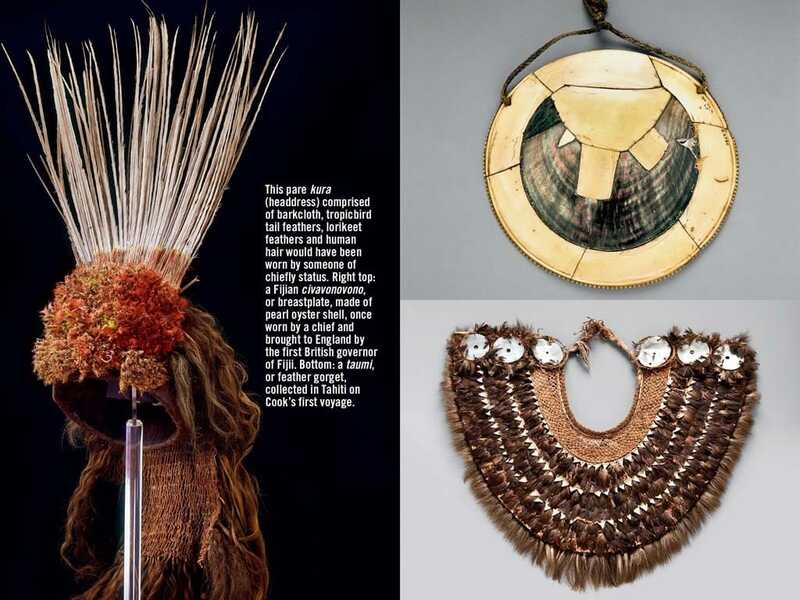 There, encased in glass, are many of the items I’d seen in the book: a Māori shell trumpet and dog-skin cloak; a wooden Tahitian breadfruit splitter and a fish-skin drum; a Tongan whaletooth necklace and another made with bird bones and turtle shells. 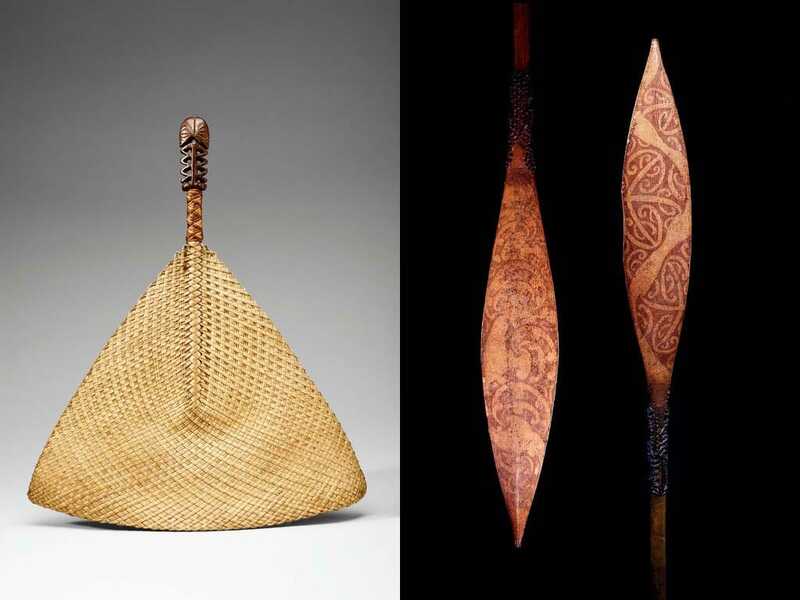 Viewing these items up close, I marvel at the ingenious ways Pacific Islanders used the environment to fashion the implements of everyday life. “Only about 1 percent,” she replies before ushering me into a storage area stacked high with carefully labeled wooden crates. Pulling open a pair of wire-screen doors, she unveils a collection of what seems like a thousand Polynesian war clubs—each one tagged, attached to a screen and engraved with elaborate geometric designs. In an adjacent workroom, she shows me several other artifacts that I had asked to see, including two items Cook had acquired in the Hawaiian Islands during his third voyage: a bracelet made from boar tusks and a handsome shark’s tooth knife. She then shows me something I hadn’t asked to see: a magnificent crimson, gold-and-black ‘ahu ‘ula, or cloak, that had belonged to Liholiho, King Kamehameha II. Made from the feathers of native Hawaiian forest birds, it has a wingspan of at least nine feet. Admiring it, I realize I am looking at something most Native Hawaiians—or anyone else—will never see. “Some artifacts are spectacular works of ritual art,” says Thomas. “Others are everyday objects like fishhooks that are expressions of islanders’ knowledge or skill.” Above, a boar-tusk bracelet from Hawai‘i collected by Cook and a portrait of Cook. Thomas emphasizes the importance of the term “encounter.” Cook’s voyages were not just about understanding the geography of the Pacific; they were also about an incredible series of meetings with the region’s diverse cultures and the transactions that brought these artifacts back to Europe. Although there were dimensions of misunderstanding, violence and tragedy associated with those meetings, there also was sharing and mutual curiosity that the authors seek to explore. Questions regarding what the islanders involved in these encounters thought are equally intriguing. Maia Nuku, one of the book’s co-editors and the associate curator for Oceanic Art at New York’s Metropolitan Museum, tells me that most of what we know about these exchanges comes from the diaries and journals of European voyagers. There is no equivalent history on the Pacific side of the equation. Only the artifacts remain to help tell that side of the story. At left, a sketch of Māori paddles by Sydney Parkinson, the artist aboard Cook’s ship Endeavour. The paddles were acquired on October 12, 1769, three days after Cook had made first contact with the Māori. 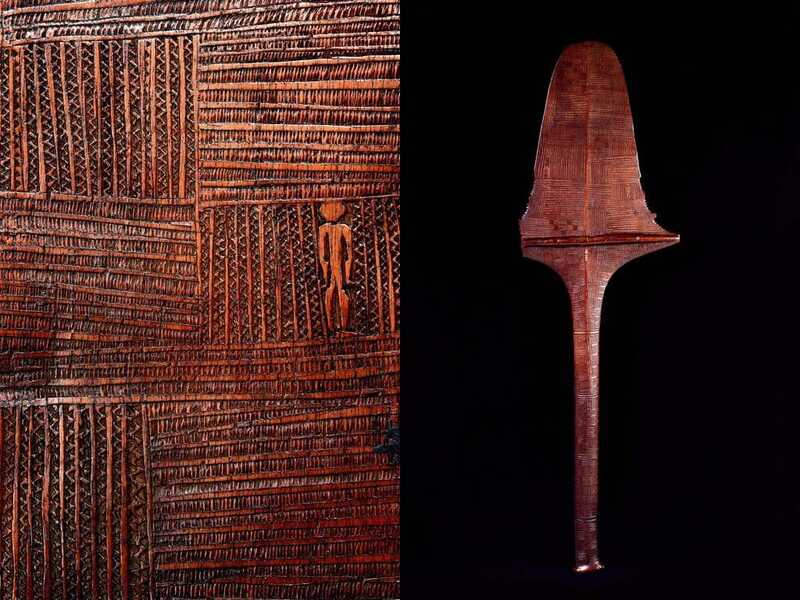 At right, a Tongan war club carved using Western nails rather than traditional shark’s teeth. A Māori tekoteko figure collected by Carl von Hügel in 1834; such figures would adorn the apex of a roof. When Cook departed Tahiti, he took with him a Tahitian navigator-priest named Tupaia to serve as his interpreter. Sailing west and south across the Pacific, he reached Aotearoa in October 1769, where his first encounter with the Māori people turned violent. Elsewhere, however, his encounters were more successful and vigorous trading ensued. One famous exchange took place on October 12, 1769, when a group of Māori canoes approached the Endeavour near Poverty Bay off the east coast of North Island. Tupaia, who had brought with him Tahitian fabric of great value, is thought to have traded it that day for a set of Māori canoe paddles of equal value. The paddles had distinctive carvings on the looms, while the blades featured intricate kōwhaiwhai designs stained with kōkōwai, a red paste highly prized by Māori for its sacred color and reserved for objects of status. Two of the paddles from Tupaia’s original set are now part of the Cambridge collection. And while the dye has faded, the kōwhaiwhai designs are still visible and thought to be the world’s earliest surviving examples of this distinctive style of painting. From Aotearoa, Cook traveled up the eastern coast of Australia, encountering wary aborigines along the way who showed little interest in trading. Farther north, the Endeavour ran aground on the Great Barrier Reef and had to be repaired. In Batavia (modern-day Jakarta), an outbreak of typhus killed many in his crew, including Tupaia. From there Cook sailed across the Indian Ocean and around Africa, arriving back in England in July 1771. Cook’s first voyage and the artifacts it produced generated tremendous interest among the British and European public, and that interest only grew with each succeeding voyage. Scientists were fascinated, and books about the voyages, containing engraved images of the islands’ flora and fauna, its peoples and artifacts, were among the most popular publications of the late eighteenth century. A tahiri, or sacred fan, collected in the Austral Islands in the 1820s. The artifacts themselves found their way into major museums throughout Europe, marking the first time that large collections representing the arts and cultures of indigenous people were carefully and systematically described. Fascination with Oceanic materials was such that they were the first non-European art forms to be avidly collected by Europeans. Today these artifacts and works of art continue to have tremendous significance for Pacific Islanders and other indigenous people around the Pacific Rim. For many, these works are vectors of spiritual power, or mana. They are not just things made by their ancestors; they are ancestors, a view that reflects a way of relating to the world far different from Cook’s. In Western tradition, humankind sits atop the evolutionary ladder, separate from and holding dominion over the plants and animals. By contrast, the relationship to nature in Polynesian and other indigenous cultures is one of kinship and family. Ancient Hawaiians, for example, believed they were directly related to the plants and animals that shared their world, and that both animate and inanimate things possessed mana. They believed that beings with great mana could take on the form of other plants and animals, and that one’s spirit might cycle through other living things after human death. As the youngest descendants among living family, humans had the role of caretakers, while the older siblings of the ‘āina (land) offered guidance. In such a world it is easy to see why works made from birds, trees and marine life would be considered ancestors. In Māori culture the word taonga is used to describe important material possessions that contain the living presence of ancestors. In Tonga the corresponding term is to‘onga; in Sāmoa, toga; and in the Society Islands, taoa. The most valuable taonga were rarely given to outsiders. They were handed down among kin groups to affirm ancestral ties and bolster networks of reciprocal obligation. “The more valuable the taonga that was given, the greater the obligation on the part of the receiver,” Nuku says. Over the course of his Pacific voyages, Cook brought back highly valued taonga that were given to him by high-ranking chiefs in ceremonies that sometimes lasted days. In a discussion of Polynesian ways of relating, Nuku and two other of the book’s co-authors argue that similar cultural mores help explain why these exchanges took place. Although Cook was an outsider, he was regarded by native chiefs as a man of the highest status and someone with whom they wanted to ally and bind to their networks of power and influence. Te Po, a chief from Rarotonga, Cook Islands, depicted above in 1839 wearing a pare kura (headdress) similar to one in the museum’s collection. During Cook’s first visit to Aotearoa, two of the most valuable taonga he received were a pair of Māori cloaks that are now part of the Cambridge collection. Similarly, while visiting Tonga during a later voyage, he and his men were given more than twenty sisi fale waist garments and three palā tavake feathered head-dresses—items that were among the most prized and heavily guarded valuables held by Tonga’s ruling family. Cook made the first European sighting and exploration of the Hawaiian Islands in January 1778—only to meet his death a year later at Kealakekua bay. His successor, a young midshipman named George Vancouver, witnessed the event. Vancouver, who later captained his own Pacific expedition (1791–1795), held the Hawaiian people in high regard and returned to the Islands three times during that voyage. Artefacts of Encounter features over fifty of the pieces he and his crew collected, including many from indigenous cultures in the Pacific Northwest as well as from Hawai‘i. Interest in these artifacts is not confined to Pacific Islanders. In recent years, museums worldwide have put their collections online, making them accessible to new audiences. Thomas marvels at the number of exhibitions dedicated to Pacific cultures that have been held in European museums over the last decade, noting that in the fall of 2018 a major exhibition on Oceania is coming to the Royal Academy in London, one of the largest venues in Europe. The exhibition, which is tied in with the 250th anniversary of Cook’s first voyage, will feature a range of work, including pieces featured in Artefacts of Encounter. Bark cloth collected by Cook. Swatches of bark cloth were later compiled into a book by Alexander Shaw in 1787, which introduced the material to the European public for the first time.